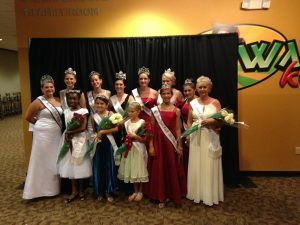 This past Monday Stephanie, Liv, Olivia, Taylor and I attended the Woodbury Ambassador coronation. Besides our own coronation, it is crazy to think that this is the last coronation we will attend! After meeting the candidates the previous morning at the pre-parade breakfast, we were all very excited to see who we would get to welcome into the sparkle section. However, it was also a bittersweet moment because we realized we would have to say goodbye to the current Woodbury ladies: Kathy, Brittany, Breanna, Megan, Noreen, Alex, and Ava. They all did an amazing job representing their community! There was not an event where they failed to make us smile. When we were at parades they were always so much fun to be around! We are lucky in the fact that we get to spend the most time with the Woodbury ladies, as their coronation is just under two weeks before our own. We know Sherry, Abby, Kylie, Paige, Nadia, Imani, and Madyson will represent Woodbury well!